IKRUSH Womens Neval Basic Halterneck Bodysuit. You need this beaut in your life girls! This bodysuit has an on-trend halterneck neckline and is made from a soft stretch fabric. It has a low scooped back and a simple popper fastening. Team with skinnies and heels for a gorge look you can wear from day through to night!Viscose/elastaneUnderarm to hemline is approx. Providing quality, stylish and affordable fashion is our main focus. Our buyers and designers go above and beyond to ensure we provide the styles you love at amazing prices. At IKRUSH, you, our customer is always first. That is why every step is taken to ensure that you receive exceptional service at all times. We serve to inspire, invigorate and illuminate life through fashion. IKRUSH Womens Cassidy Off Shoulder Bodysuit. IKRUSH Womens Nadiah Lattice Bodysuit. IKRUSH Womens Gianna Velour Off Shoulder Bodysuit. 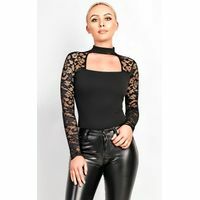 IKRUSH Womens Toya Choker Neck Lace Bodysuit. IKRUSH Womens Abbie High Neck Eyelet Bodysuit. IKRUSH Womens Elektra Choker Lace Bodysuit. IKRUSH Womens Rosilee Velvet Embroidered Bodysuit.